Austin Hemmingson | Daily Press Bay College’s Marcus McKenney (23) drives against Bryant & Stratton College’s Joe Duty (30) Saturday at Bay College. ESCANABA — In a game of runs, one second half run was too much to overcome for the Bay College men’s basketball team here Saturday. The Norse fell behind No. 25 Bryant & Stratton early in the second half and couldn’t overcome their deficit, falling to the Bobcats 88-75. The Norse trailed just 44-43 at the half and took a 49-47 lead on a layup by Kobi Barnes with 17:26 left in the game. But the Bobcats responded with a 22-5 run, capped by a three-pointer from Justin Brookens with 9:43 left to blow the game open. The Norse (16-9) cut the deficit to 10 on a few occasions the rest of the way, but never got any closer. Bobcats’ coach Mark Majkrzak said they used a different plan in the second half. “We went in at the half and didn’t think we played as hard as we possibly could,” Majkrzak said. “So we changed up to a full court defense, which forced us to pick up our energy and it allowed us to force some turnovers and turned it into a different game. We only had four turnovers and they had 16. The Norse jumped out to a 10-3 lead on a triple by Ryan Robinette of Escanaba with 15:49 left in the first half. The teams took turns trading runs the rest of the half, with neither leading by more than seven. Brookens and Kyle McDermed were the biggest offensive contributors for the Bobcats (20-7), as Brookens scored a game-high 26 points and McDermed chipped in with 21. 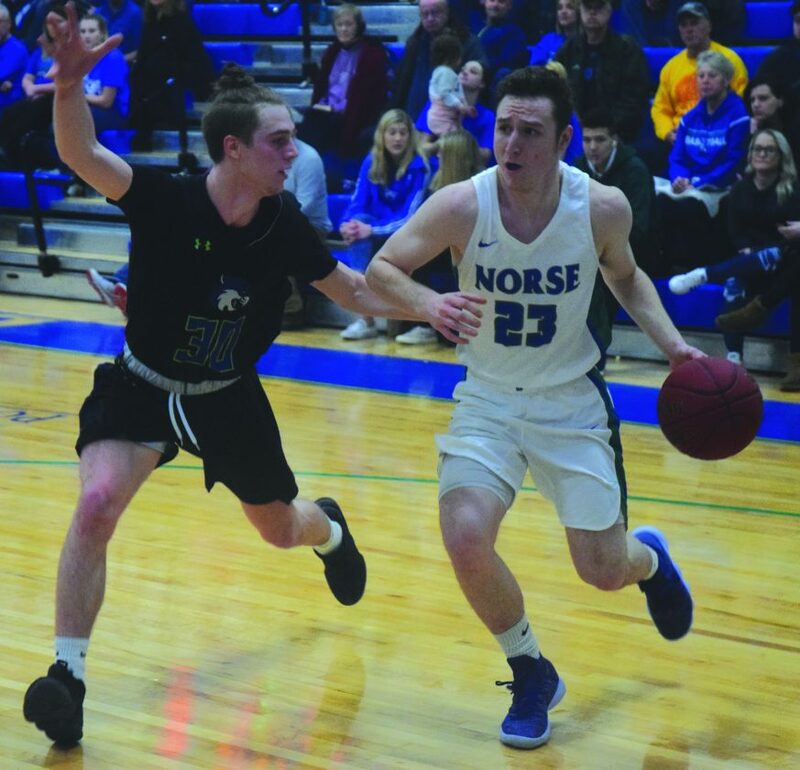 Ryan Arndt of Bark River-Harris was a bright spot for the Norse, hitting six treys to finish with 18 points as Bay’s leading scorer. “Ryan had a great shooting night,” Johnson said. Barnes had 15 points and Robinette added 10 for the Norse. Manny Jingco had 11 points for the Bobcats. Bay visits Alpena Community College tonight. Bryant & Stratton — Brookens 26, McDermed 21, Jingco 11, Sosa 9, Duty 8, Thompson 5, Cooper 5, Schneider 3. F: 17; FT: 10-14; Fouled out: Thompson. 3-point field goals: Jingco 3, Sosa 3, Brookens 2, Duty 2, Thompson 1, Cooper 1, Schneider 1, McDermed 1. Bay College — Arndt 18, Barnes 15, Robinette 10, McKenney 9, Alexander 7, Fields 7, Willette 4, Contreras 3, Yohe 2. F: 13; FT: 13-20; Fouled out: None. 3-point field goals: Arndt 6, Robinette 2, Fields 1, Contreras 1.